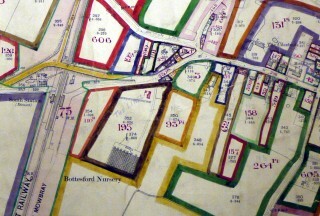 The Limes and Nottingham Road Nursery 1900 The greenhouses occupied an area of 150 x 300 ft. 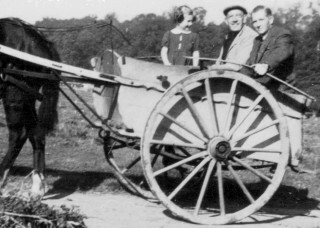 The Limes 1942. Left to right:Grandma Baggely (Patti), Hilda Baggley (Joy;s mother), Grandma's sister, Annie (Nan) Front: Joy Simpson (nee Baggley). Ann Hargreaves, Frank Baggley, Billy Evans, The Nurseries Market Garden South Station House in the background. In the trap at Belvoir, 1941. Joy with father, Frank Baggley, and right, Mr. Chettle, R.H.S. Belvoir Farm Manager. I’m Bottesford born and bred, but my mum was from Lancashire, Manchester. And my father, Frank Baggley, was from Louth in Lincolnshire. 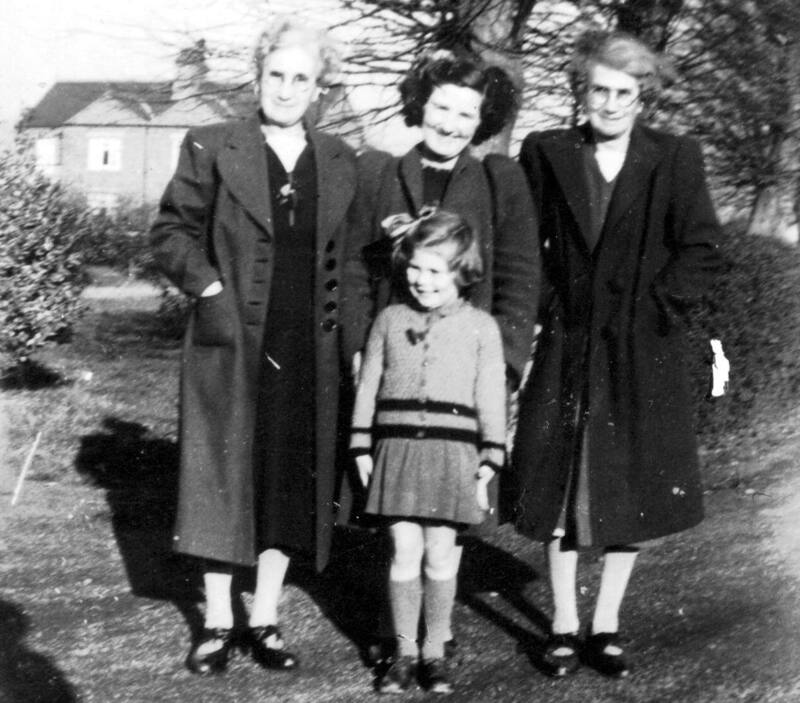 My father met my mum in Manchester when he was a Methodist pastor there and he was going to go in for the ministry. 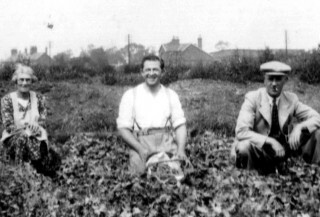 But his father and mother and aunt lived in Bottesford and they’d come from Louth to a beautiful house, The Limes, and these market gardens which were quite a large area and a very beautiful place. Five acres they were. Glass houses a hundred yards long. Under glass and open air as well. It was a very big enterprise. It concerned me how they’d managed to afford this and so I’d been looking into the history of my parents and grandparents. 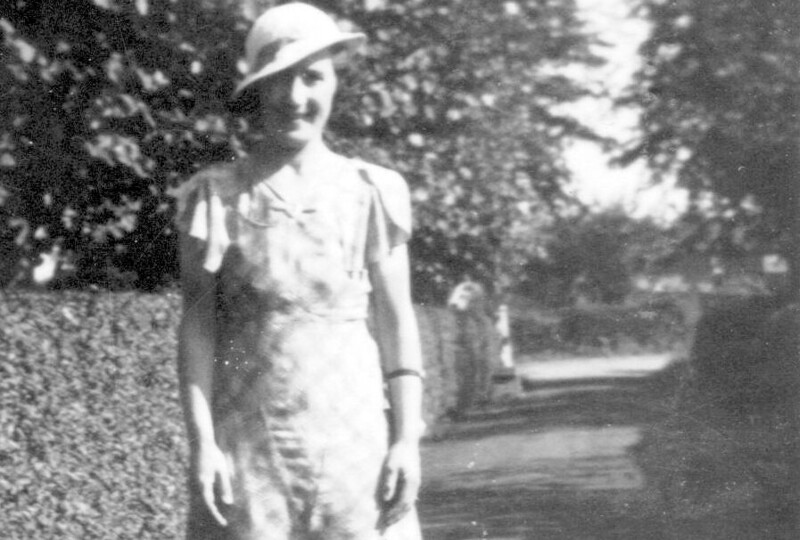 My grandfather worked for a very well- to-do man in Louth, Mr. Ingleby. My grandfather looked after the gardens and the horses and Mr. Ingleby was very fond of my granddad. He had a son who was an embarrassment to them. I don’t know what illness he had but we think it was First World War injury. Shell shock. They tended to hide him away and in those days it was a big embarrassment. We wondered if maybe this is one of the reasons they helped my granddad buy the market gardens at Bottesford. In the garden was this chalet type of shed, well kept; and there was this man who lived there. He didn’t really know what he was doing. He’d sometimes dress up as an Indian and dance around the garden and my parents were quite protective of me and used to tell me not to go over to this chalet. He was known as Jeff and lived he there all the time. He helped a bit in the nursery I think. My granddad was very good to him and my mum and dad were very kind. My father took his meals. We think now, that Jeff was the son of this rich gentleman that had set my granddad up in the market gardens. Grandfather had twelve green houses. They were specially set aside for cucumbers. He employed Billy Evans who lived in Hands Walk, the cottages that used to be opposite the VG shop (now the Spar.) 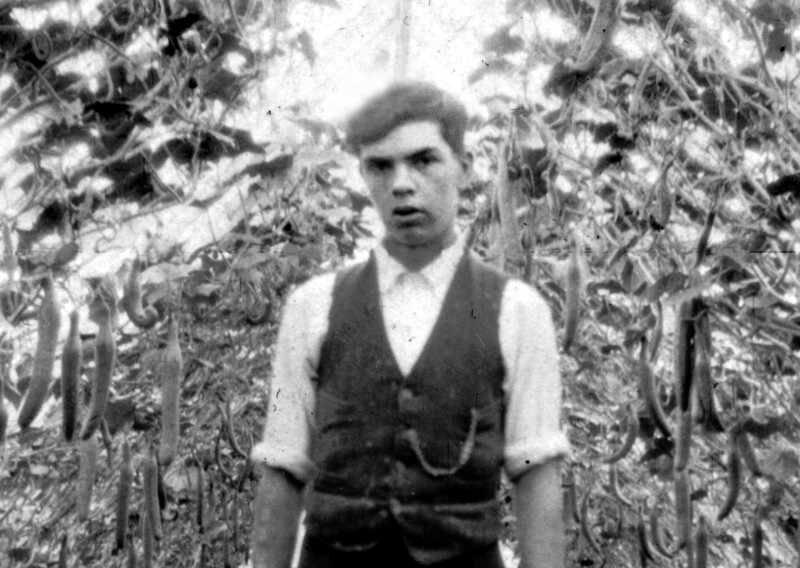 His job was to look after these cucumbers. There was also a lady called Mary Hallam, who used to live across the road. 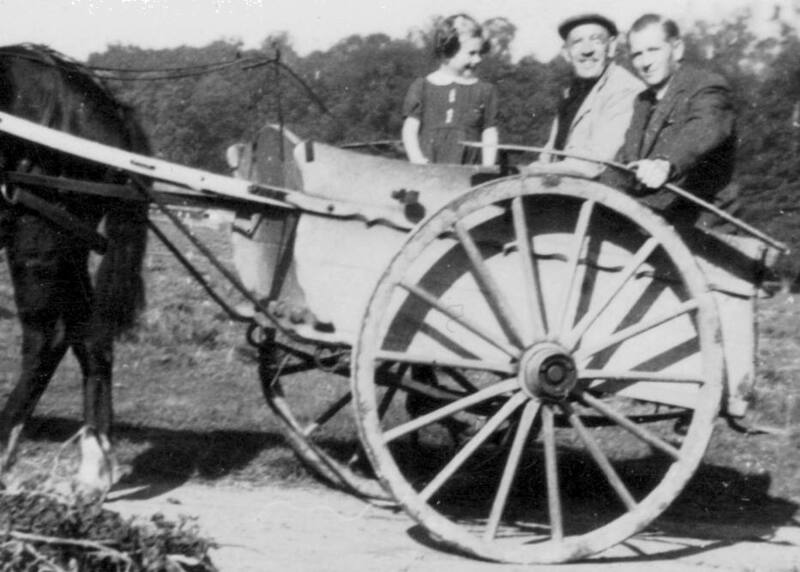 These were the people who worked for them; Frank Wilkinson, Sam Marriott, Mary Hallam and Billy Evans. There were some part-timers but those people were full time. 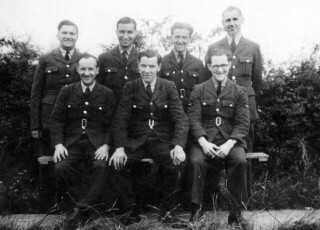 They all worked very hard and during the war my father supplied the Normanton RAF camps and the army camp here, with potatoes and vegetables and tomatoes. There were thousands of people. 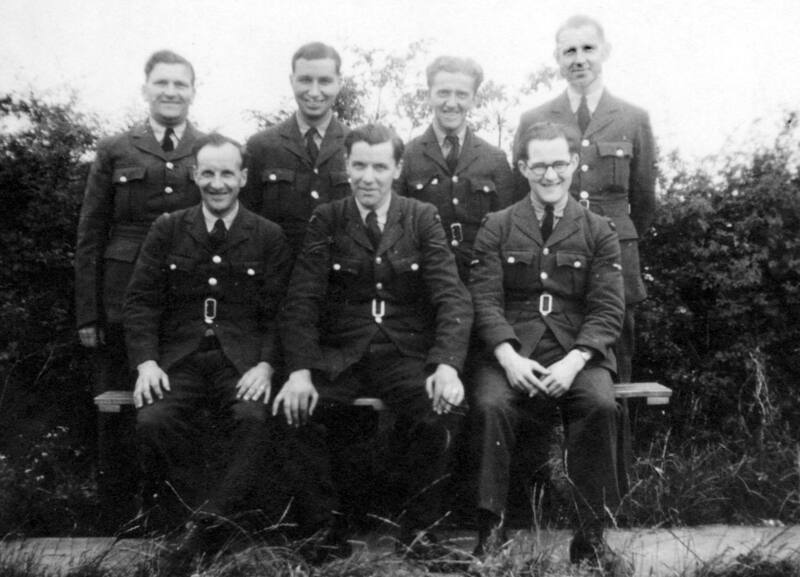 He supplied tomatoes and things for the RAF officers’ mess and when the nursery ran short of water because the wells were running dry the RAF men sent water barrels down here to protect their supply of tomatoes. We were very lucky weren’t we? It wasn’t just seasonal work, the people worked all the time more or less. But dad, of course, looked after things alone early morning and evening. And in the winter it was so cold! We had lots of snow in those days, and he’d go down to stoke the boiler fires up at twelve o’clock at night. Then he’d get up at five to go and stoke the fires up again for each greenhouse. It was a hard life. Then in 1947 there was a terrible snow storm and it flattened all the greenhouses. Every greenhouse. It was very upsetting. So that they were all knocked down and shovelled away. Yes, that was heart breaking, that storm. But they were rebuilt, two purpose built greenhouses with side walls. He was well known for his tomatoes. Dad looked after his tomato house. And I’ve never tasted tomatoes like them. People came all over to buy tomatoes from him. He supplied local shops as well, Newark, Grantham. He stood on Grantham market. And also he did a funeral flower service. He did the most beautiful wreaths and he did bouquets for weddings and in the winter, of course, people liked the holly wreaths to put on their doors. I can remember often in an evening my mum and dad and my grandma and my aunt, they’d come to our side of the house and we’d all be sitting round and we’d be wiring the holly. It really played havoc with your fingers. I found that out when I got older. Everybody helped. It was a hard life but it was a happy life. My father was a lay preacher at the Methodist chapel as well. He preached all his life and he – well, I know he was my dad, but he was a good preacher. And he was such an organiser. He organised fetes, he organised outings, the scouts, you know. He was full of enthusiasm. He was good friends with Howitts. 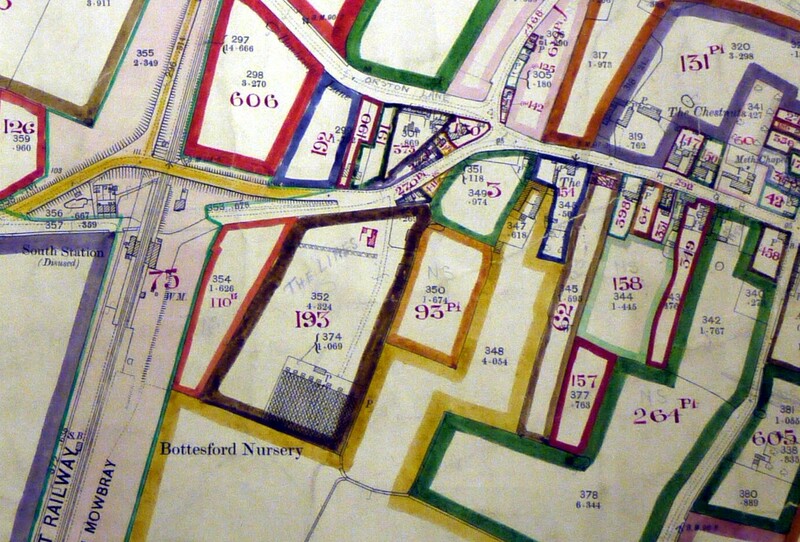 They had their nurseries on Belvoir Road, The Vineries, and Bagleys had their nurseries here, on Nottingham Road. They were on the same vein of soil, specially chosen. Beautiful, sandy, fertile soil. Well drained. They helped one another out because they specialised in different things really. I used to go to market with my father when I got older. Later on when I’d met John we’d go to look after the market stall during Dad’s holidays. Dad also supplied a lot of the shops in Newark, but. Grantham was his main outlet. Of course, on top of all the food crops, in the spring he grew a tremendous lot of bedding plants. He sold a lot of wonderful plants and obviously people knew how good they were. In the spring, people came from all over for his bedding plants. He’d worked it out very well, whatever was needed at each season. So every month things changed as you went to market. He used prepare two years in advance didn’t he? People still wanted their tomatoes and cucumbers and their vegetables, that was always busy, and the bedding season was always busy. But of course the people dad employed finally retired. We’d had tremendous inflation in the early 70s and I think suddenly people didn’t earn enough money for that kind of work. I don’t think he could afford to pay them the sort of wage they needed to live.He retired about 1971. He was sixty five. Tim and Wendy, my sister, took it over but it was a dying trade really. I think supermarkets were coming in. Dad was a real joker, but he was the kindest person. This page was added on 03/08/2013.